You’re the experts. You live this stuff every day and we need to hear from you. If you write an article on goat health, home dairy, chickens, a story for the funny farm, or share a cheese recipe (really, anything that is going to be helpful to our customers and fit in the Hoegger Farmyard), send it in to us. 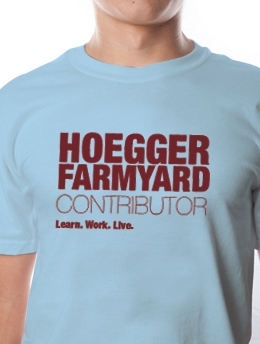 If we use it in the HoeggerFarmyard or our monthly newsletter, we’ll send you this great shirt as a “thank you”. So if you have an idea for a great article and the knowledge to write it, send it in! We’d love to share your experience and knowledge with our folks who may be needing exactly what you have. Make sure you include your name, your farm name, and your contact information. 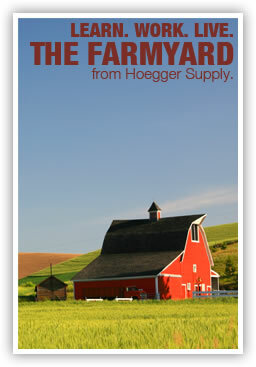 By sending an article to thefarmyard@hoeggerfarmyard.com you agree to allow Hoegger Supply Inc. full usage rights to edit and publish the article. Not all submissions will be published.